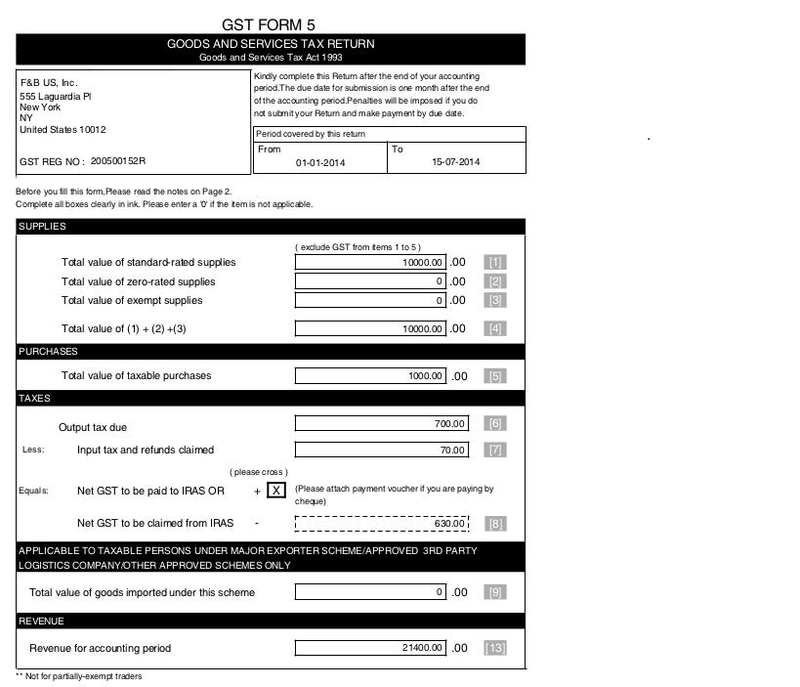 We have 2 reports related to GST . Let's see how to generate these reports. General Ledger : General Ledger of the Client . Sales Tax Register : Sales Tax register for recording sales related taxes in Tax Payment. Purchase tax Register : Purchase Tax register for recording sales related taxes in Tax Payment. 1) Only one record should be available in GST FROM Setup . Click “Pdf Report” button to generate the report . 3) GST Form print will create a record in GST Form history . 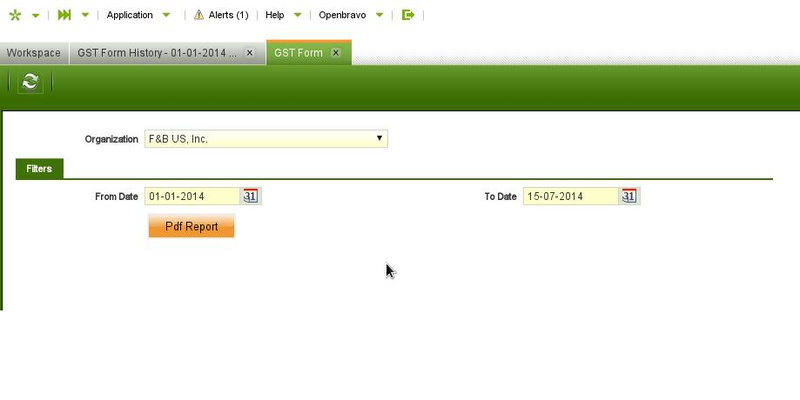 GST Grouping Details report will be printed from the GST Form History window . Click the print icon to generate Grouping Details Report . You can see all the invoice,tax details which are used to generate above reports in Tax Payment window. In Wholesale Fresh and Frozen meat business,market is volatile and product price will fluctuate everyday from -25% to +25% based on supply/demand. It's difficult or practically impossible for a manager to revise price/price-list every-time based on purchase. Why don't we let system to derive prices automatically? Is it possible? Sales man should know price limit,sales price,market price to tackle bargain. System should throw alert if any product sales price is less than product cost and system should notify the same to manager. In some cases,manager need permission to overwrite sales prices defined by system. Mapped pricelist schema with pricelist and applied check boxes "Enforce Price Limit","Price List based on Cost"
Wrote a new scheduler to create product prices based on pricelist schema. 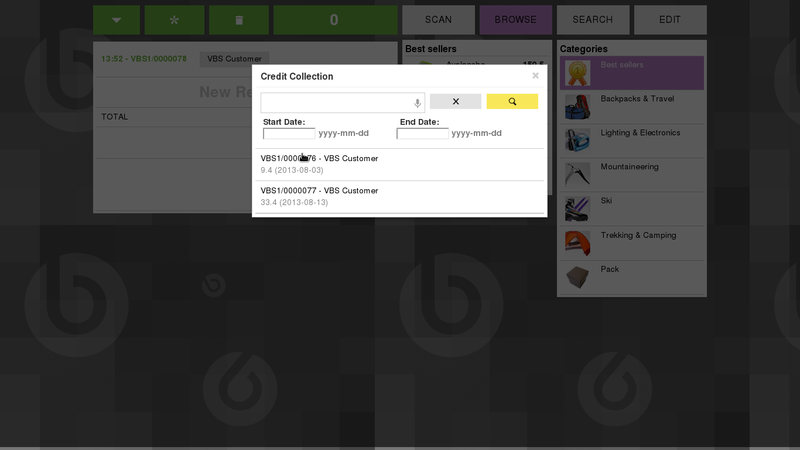 Created a new tab "Warehouse" under pricelist to know about stocked products. Enabled existing feature "Enforced Price Limit" and updated. Created an alert and scheduled email to notify manager ( every 5 minutes). Remove all not stocked products from pricelist - product price. Confirmed/added all stocked products from price list - product price. If product cost not found(i.e new product,cost not calculated),scheduler will use last purchase price as COST. Throw an alert if product list price,sales price is zero. Scheduler will ignore product types "Service","Expense" and "Resource"
Scheduler will ignore products,if "Is Manual" is checked. Contributed by Qualian Technologies (P) Ltd.
Once customer is selected, system will automatically fetch default address and assigning it to ticket. If customer have multiple address, this can be changed by tapping the customer address button at the top of the ticket (next to customer name) which launches a address picker dialogue where a required address can be selected. In this modal window, customer address are loaded automatically, which is read only at first. Tapping a address will get assigned to actual ticket. If customer have too many address, we can able to search customer address by name, filling the input text and pressing the magnifying glass button. Choosing New Address, new address can be added. Using the Edit Address, the address can be modified. The Assign to receipt button in New Address, Edit Addresswhich helps us to assign customer and address automatically to receipt after add new or edit address, without returning back to address menu. Select Customers option in the menu. Search and select customer which requires new address. Tap Edit/New Address button in Customer Details popup. Tap the NEW in the top left corner to add new address. 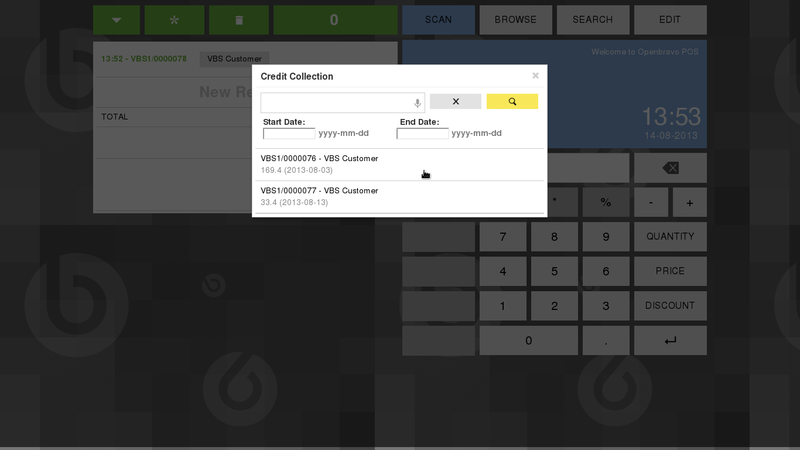 Credit sales functionality allows Openbravo WebPOS sales user to complete orders without paying and left it as credit based on customer credit limit/credit used. To enable it, the POS Terminal Type must be configured. Also, the Credit Line Limit of the Business Partner must be greater than zero. If these two conditions are satisfied, a button with label Use Credit will appear in payments section. Tap the button if the pending amount is wanted to leave as a credit. This process will check against the backend the available credit of the business partner. This quantity would be the difference between Credit Limit and Credit Used. If this amount is greater than the pending quantity of the sales order a confirmation popup will be shown. 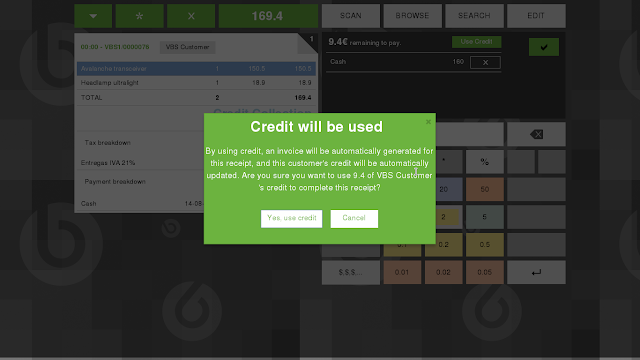 Pressing "Yes, use credit", the order will be processed. Pressing "Cancel", this action will be canceled. On the other hand, if the outstanding amount exceeds the available credit, an information popup will be shown giving the information of available credit of the business partner, and it will not allow completing the order. 1.We need more Back Office licenses to do credit collection. 2.Retails user feels difficult to learn,access Back Office UI .End user feels,he need to do some additional work. 4.In Truck sales,sales person is responsible for credit collection.So he need a option to do credit collection via WebPOS and the same need to be reflected in Cash Up process. To overcome all ,we developed "Credit Collection" functionality in WebPOS. This functionality will allow user to do following operations in WebPOS. 1.Allow payment for credit sales. 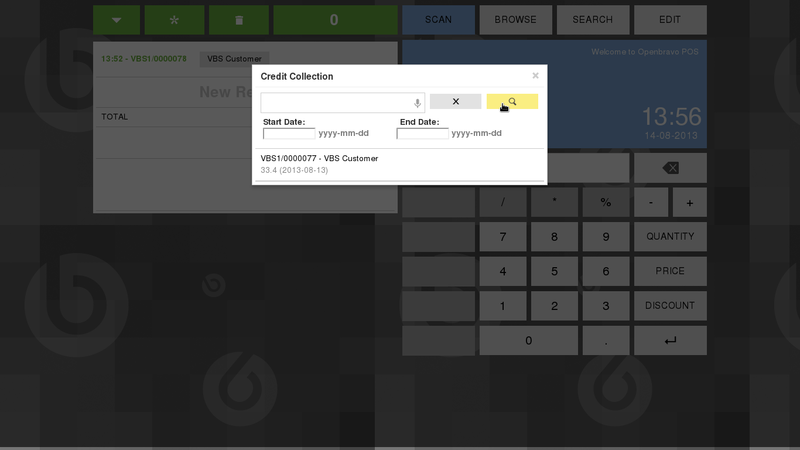 2.Able to check receipt wise outstanding amount(credit sales) via separate menu. 3.Allow partial payment and leave remain as credit on existing credit sales receipts. 4.Credit payment amount update in Credit used value. 5.All payment methods are allowed to do payment for credit sales. Selected Receipt VBS1/0000078 - 169.4 and doing a payment of 160 and leave remain 9.4 as credit. After payment of 160,Outstanding amount updated as 9.4 for Receipt VBS1/0000078. Allow user to pay 10 Euro against 9.4 Euro and considered remain 0.6 Euro as TIP. Openbravo for Retail offers a complete functionality for multichannel retailers, from Sales and Customer Relations to Finance and Operations. Its HTML5 web POS can be run on modern tablet devices, helping to improve dramatically the employees productivity and customer buying experience. 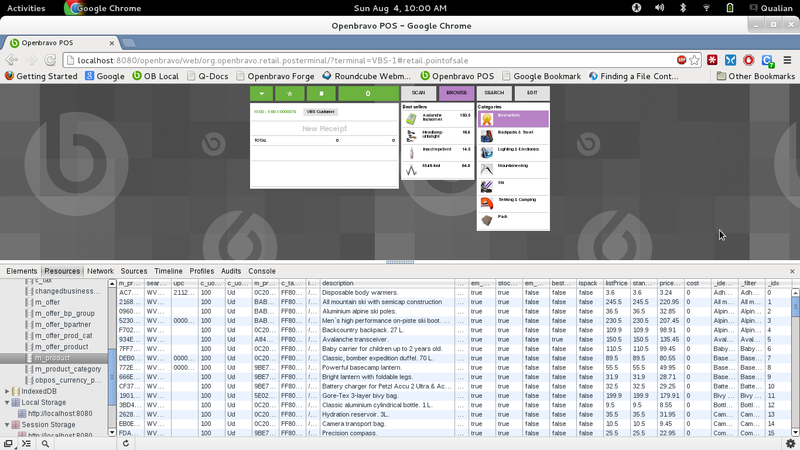 However, Openbravo for Retail is not only intended for pure retailers. Are you a distributor who is struggling with your mobilized sales force? Do you have trucks, and lack of complete control over their inventory levels in order to ensure they can fullfill all orders? Do you want to provide your drivers with a powerful tool that helps them to avoid data entry errors, improve your data quality and therefore provide support for a better decision making process? If you have answered positively to some of these questions, Openbravo for Retail is also a solution for you !. 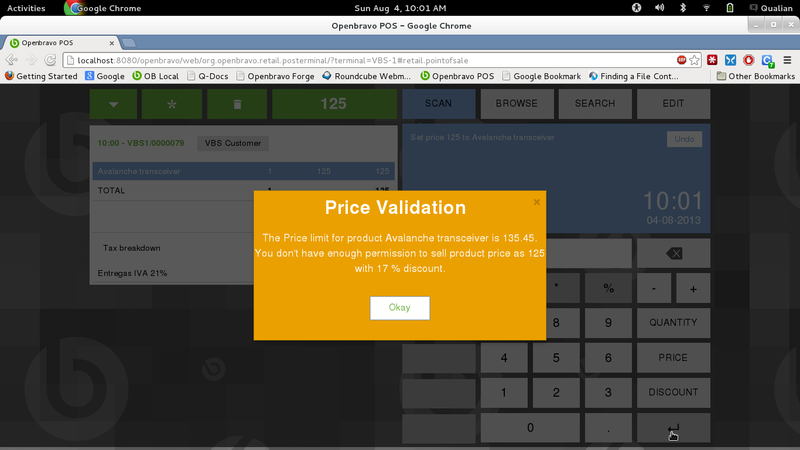 We deployed Openbravo WebPOS in Truck sales for Wholesale & Retail distribution.So truck sales man face bargain and require option to change price. Normally Sales man will reduce price based on number of quantities,Customer relationship.This is fine but company want to ensure,sales man should have a limit for every product and system shouldn't allow any sales beyond that.So we utilized "Price Limit" in pricelist and created a new module "WebPOS Price Limit Validations". Sales man requires price edit option and the system shouldn't allow any sales,less than product price limit. i)Add preference "Web POS action Change price" to "Y"
ii)Add preference(new) "Web POS Enforce Price Limit" to "Y"
Sales manager requires price edit option and the system shouldn't restrict sales based on price limit. ii)Add preference(new) "Web POS Enforce Price Limit" to "N"
It's possible to set preference based on role,user. Example(case - 1): 1)Avalanche Transceiver ,selling price is "150.5" & Price Limit is "135.45"
2) Sales man selected "Avalanche Transceiver" for sales. 3) Sales man changed price to "125" and got warning from system with detailed information. 4) Once user clicked okay or closed popup,selling price updated back to last value. Price Limit validation override for certain products.Allow user to sell some products without any price limit(products going to expiry soon) and remain products with Enforce Price Limit(with Validation).New rule logic is product+role, product+user. Any question related to Openbravo ERP?